The disc-jockeys who work at Twin City Sound take a lot of pride in the fact that our team has provided professional ceremony and/or reception services to thousands of happy couples over the last twenty years! Our goal is to help make your wedding day a truly wonderful experience. We are always on time, professional and know exactly what the bride and groom want on their wedding day. We stay in close communication with the bride and groom before and during the big day. TCS has a completely online planner that you can access from our home page. The planner is a guideline for the DJ to follow and tells the DJ what kind of music you would like played or not played and any special events that you would like him or her to perform. Included in the wedding planner is a song list data base that will help you find the most popular dance songs sorted in many different genres and decades. Generally, a wedding reception starts with the married couples first slow dance, which we call the spotlight dance. Then, usually, we will perform a father/daughter or mother/son or bridal party dance. The dances and order are completely up to the bride and groom. After that, we usually speed things up with a few classics and requests that everyone likes. After the first hour, a dollar dance is a nice way to dance with and thank your guests for sharing in your wonderful day. This activity is also completely up to the bride and grooms discretion. Approximately halfway through a reception is when we usually perform a garter and/or bouquet toss or auction and once again, only if the married couple request the activity. Towards the end of the night, some guests may start to request more risqué types of music. Our knowledge of popular music when used in conjunction with the online reception planner will help the bride and groom buffer the lyrics of songs that the newlyweds may or may not want to be played at their reception. TCS DJ's love to take requests, interact and can perform/teach most of the popular group dances that are enjoyed at wedding receptions here in the upper mid-west region of the United States. These dances are listed in the specialty song list portion of the wedding planner. Twin City Sound also provides music for both indoor and outdoor ceremonies. If you're getting married at a beautiful remote spot, we can bring the P.A. system almost anywhere and provide 3000 watts of power where there are usually no electrical outlets. We are able to do this with our power inverter and show van. TCS can also provide: processional, recessional, prelude, postlude, seating or candlelight music. Our DJ's are professional, considerate, knowledgeable and talented. Their timing in mixing music and interaction is perfection. We want you to be super confident in your choice of Disc-Jockey. TCS DJ's dress professionally. Video projectors can be rented for your wedding. 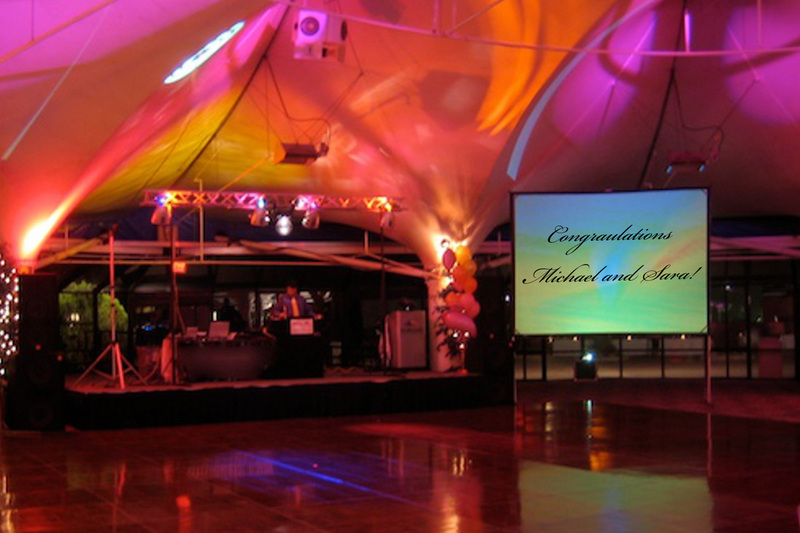 The projectors are perfect for showing slide shows during receptions. The slide show can be projected onto any white wall or if a screen is needed, TCS will set-up a 5'X7' front/rear projection screen. Music videos are also available. TCS receptions can include: up-lights, fog machines, strobe lights and lasers available for an extra touch of visual energy. Are you interested in a personalized music mix for a choreographed dance? TCS can produce a unique music mix packed with cool transitions and sound samples. Need help with music research? View our Online Music Library by clicking on the popular list buttons. Q. How much of a deposit do I need to put down? A. We ask for a minimum deposit of $200. You can put more down if you want to and the entire amount is credited toward the final bill of the specified date. A. One week prior to the performance date. A. Credit/Debit card, personal check and cash are all valid payment options. Q. What time will you arrive? A. We will arrive one hour prior to the start time and be set up within a 1/2 hour, leaving approximately a 1/2 hour to spare. Q. Can you set up the equipment earlier than one hour before the start time? A. Yes. However, anytime earlier than one hour before the start time constitutes a $100 early set-up fee. For example, If you wanted the DJ to start at 8 p.m. but needed the equipment to be set up by 5 p.m. then the $100 early set-up fee would apply.